Hello. I have been very quiet all summer and there is a reason why. For some time an idea for a new book on food and wine has been buzzing about in my head and I thought it was about time I got on and did something about it. So I wrote a short proposal and sent it to my agent, Lizzy Kremer, who is very brilliant and beady (just don’t try to kiss her hello while wearing lip gloss, you’ll get trapped in her magnificent hair). Lizzy got in touch with a few publishers and, before I knew it, we were in the midst of a bidding war with five imprints competing for the rights. It was a whirlwind couple of weeks. When you go for meetings with prospective publishers everyone is interviewing everyone else. The publishers want to work out what you’ll be like to work with and how much they think your book might be worth. As an author, you’re looking for a team who ‘get’ what you’re trying to do, and who will also be able to pick up your idea and make it better than you ever imagined it could be. Each editor will shape the content of the book in a different way. Each designer will visualise it in a completely different way. Then there’s the fact that, as an author, what you really want is to sell gazillions of copies. So there is another,more hard-headed, set of decisions to be made. Will the corporate might of a large publisher be more effective at getting your book into the shops where people can see it? Or will they be more focused on their long list of TV authors whose books routinely top the bestseller lists? Is it better to go with an established publisher of food and drink books? Or do you have more chance of creating a breakaway title if you opt for a boutique publisher with vision? And so on. So, we sold the book. And then, as the excitement died down, I remembered that this meant I had to write it. I have spent all summer glued to my laptop tapping away at The Wine Dine Dictionary: An A to Z of Suggestions for Happy Eating and Drinking. The first draft – which will then go through an editing process – is very nearly finished. I am tremendously excited to say that it will be published by Granta next year. Granta published my first book, How to Drink, and did a terrific job. Despite this, I had actually sworn I wouldn’t sell The Wine Dine Dictionary to Granta because the editor who is now there is a good friend of mine from way back, and I didn’t want to put an important friendship at risk. In the end, though, I couldn’t help myself. The Granta team is brilliant. And I couldn’t be happier to be working with them all. (And no, in case you’re wondering, this is not the publisher with the sharp auction tactics). Here’s the bottle of wine I celebrated with. It isn’t in the usual price range, but when you have good news, I think something special is called for. Also, I shared it six ways. So it worked out at about the same cost as a round of rubbish G&Ts in a London bar. Also, in honesty, it isn’t actually easy to find a properly special bottle of wine even at this price. Not one that has some age, and just the right amount of age. This nails it. Legendary red from Provence. A blend of syrah and cabernet sauvignon, it has structure as well as ease. An incredibly complex wine, that unfurls in your glass like a perfume, and smells of wood smoke and the dried herbs and scrubland on a craggy, sun-baked hillside in the south of France and warm fruits grown in the south of France. I opened this over a dinner at home with wine friends and a winemaker, and it proved completely arresting. A wine with emotion. We sniffed it happily, we wallowed in it. We fell in love. Thank you! Hopefully the new book – which won’t be out for a while yet – will do the same job for wine. 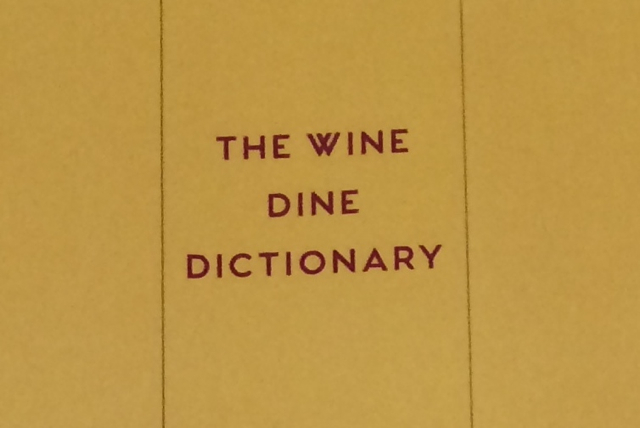 Congratulations on you publishing deal for The Wine Dine Dictionary! I really look forward to reading it and sorry for interrupting your hard work through the Summer with wine enquiries from Hungary! There have only been two days off since June, I have to admit. And that includes weekends. So sorry to hear you’ve had so little time off and apologies again but thank you for your patience and constant encouragement to explore wine. Nice reading and congrats. Looking forward to the new book. I like your price justification for the bottle of wine. We had two cocktails last night at a London hotel bar. £45! Lovely post as ever – these always brighten my day! Very much looking forward to reading the new book. And trying that delicious red. Well done. Looking forward to reading it too! Hi Ed – I think any bottle that tastes thin and vinegary has to be faulty. I’d guess corked in this case. You don’t always smell musty TCA in corked wines, it sometimes manifests as an absence of fruit in the wine. I always describe those wines as being ‘scalped’. They are partially corked and hard to spot but you know the wine tastes rubbish so realise that something must be up. However, you ask if it might be past its best which suggests an older wine. What was it? I wrote a piece on party wines in June, pegged to the wedding season. Not all prices still current but should help. Have you let the Wine Society know – they have a promise to pay you back for any faulty wines. Thankfully I have never have to use this but knowing the Wine Society they will be as good as their word. Looking forward to seeing the finished book in print. Great choice of wine to celebrate with.